All beauty and romance aside, there's a very practical reason to include herbs in your garden—they taste great. And they're also a bargain, because even if you can find top quality fresh herbs for sale, they'll probably cost you a pretty penny. The few times I succumbed to those expensive, tiny plastic packages of so called 'fresh' herbs at the supermarket, the experience almost killed me—especially when I was buying something I often have growing in profusion, like dill. When you grow perennial herbs such as oregano, rosemary, thyme, and chives, your initial plant or seed purchase will often reward you for years to come. I don't usually have much luck growing herbs in pots (you can read about my rosemary growing adventures here, though sadly that big bush in the greenhouse I wrote about died this past winter), but this beloved pot of Greek oregano has been going strong for at least five years (and probably more like ten—my memory and garden records are terrible). Although I keep it trimmed back throughout the growing season each year, it's probably totally rootbound. When another pot of oregano in the greenhouse sprouted up a few weeks earlier than this one, I was afraid I'd finally killed it, but fortunately it came back to life, and so far seems to be doing fine. The truth is, I'm half afraid to transplant it, for fear that I will end up killing it. Maybe I should just try digging up and transplanting part of it and see what happens. One advantage to growing herbs in containers is that you can move them to a warmer and/or protected spot for the winter. My pots of oregano spend the coldest months in the unheated greenhouse, covered with old sheets and blankets when it's really cold, and then are brought back out into full sun for the summer and fall. As long as they're well watered, they thrive in the heat and humidity. If you've only used dried oregano in cooking, I urge you to get yourself some of the fresh stuff, and fast. 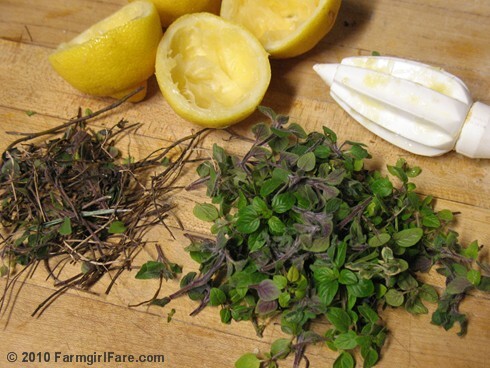 There's no comparison when it comes to flavor, and when using fresh herbs that are stemmy like oregano and thyme, you can use just the leaves in your cooking. You can see in the photo above just how much of the oregano plant is stem, and because dried herbs are usually made from the entire plant, you're often paying for—and eating—a lot of stems. I love using chopped fresh oregano along with basil in fresh tomato pizza sauce, in summer salads like this Greek Style Panzanella, and in homemade Italian sausage (the recipe for which I've been meaning to post for ages). One of my favorite ways to use it lately, though, has been in this Slow Roasted Greek Style Leg of Lamb with Lemon, Oregano, Potatoes, and Swiss Chard, which is also one of my favorite ways to eat our grass-fed lamb. It takes a while to cook, but the prep work is minimal, and the leftovers are fantastic. Drying your own oregano for the winter months is simply a matter of harvesting it in early morning when the flavorful oils are high and putting the leaves in a warm, dark place until they're dry. I put mine in a brown paper bag, clipped shut with a clothespin. Sometimes I quickly dry herbs in my handy dandy food dehydrator, a wonderful investment, especially if you like dried tomatoes. There are many strains of oregano available, and while purists claim that 'true' Greek oregano is the only one worth growing, it's really a matter of personal taste. Last year (or was it the year before?) 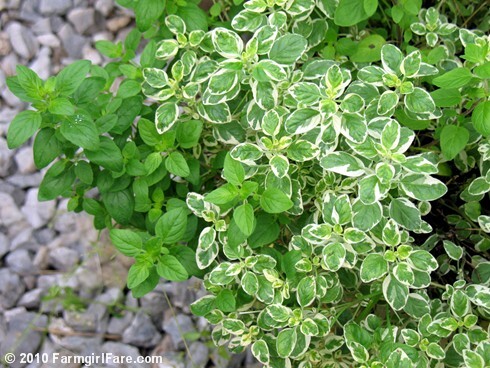 during a garden center clearance sale, I bought a gallon size pot of two types of oregano, including one with beautiful variegated leaves. I tasted them side by side and couldn't tell much difference, and I love the way those leaves look. Unfortunately the variegated one didn't seem to make it through the winter, but I suppose that just gives me an excuse to hunt down some new oregano varieties to take its place! 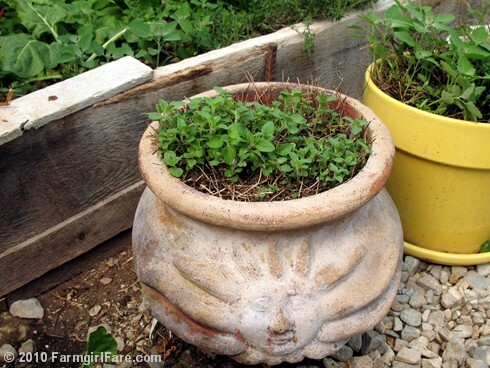 Do you have oregano growing in your garden? Any stories, tips, or favorite ways you enjoy it? © FarmgirlFare.com, the painfullly red and swollen foodie farm blog where there's nothing like the first wasp sting of the season—from one of the little buggers hiding in my jeans. Ouch. And I wasn't even wearing a dress. You should definitely re-pot that herb, if not divide it into numerous pots. I think an herb that is quite overlooked is sweet bay laurel. Any herb picked fresh is better than its dried counterpart, but fresh bay leaves are vastly superior! I love the one with the variagated leaves. I've never seen anything like it and have decided (on impulse, which is how I handle most of my garden choices) that now I must have one. Thanks for the post! I agree - fresh oregano, or any herbs for that matter- are far better than dried! I was thrilled when my oregano bounced back this spring. It's the first year that's happened. Love reading your blog by the way-it's always a pleasure visiting! That's another one of those phrases I find so romantic sounding - sweet bay laurel. And I do think it's overlooked, including by me. Thanks for the reminder! Good to hear your oregano made a comeback! Oregano is a weed in my garden. A very fast growing one! I always forget to cut back the flower heads, as I like to leave them as long as possible for all the bees and birds. I have golden oregano and regular oregano, and I love them both. I have no idea what kind of oregano I grow, and I rarely use it for anything culinary, but I have some very good reasons for continuing to grow it. 1. )It thrives in my terrible soil and cool wet winters/brutally hot summers. And spreads, which is fine with me. 2. )It stays beautifully lush green through the summer. But the reason I love it the most? 3. )It is covered for weeks with small white flowers and the bees feed and feed on it. I LOVE to provide food for bees (and I think it's very important to help native bee populations), starting with catmint in early spring and continuing from there. The oregano is a big part of that. I don't know why it is so satisfying to me to see the bees feeding on my plants, but it is! Hi, I haven't made a comment on your blog before, but I've been following it for a long while. I live in New York State I have two four year old oregano plants growing in my 'herb garden', a sunny spot set aside in the lawn. Its amazing how tolerant and hardy this plant is. I originally planted seeds in a community garden years ago and decided to dig it up and take it with me when when ever we had to move. Nothing phases it. I do not even cover it up in winter and in the spring it keeps coming back. I'm not very good at harvesting its tasty leaves, so it often goes to flower, and then I have many volunteer plants. Maybe you should try that and keep one in the ground outside as an experiment to see how well they do outside of the greenhouse and thier pots. :) Love your blog by the way. laugh now--not so funny in a few years when there are patches all over the back yard, escaping under the fence and trying to get into the front! 2 gal of round up last fall failed to dent this obnoxious WEED--in fact it looks like I treated it to fertilizer spa sessions all winter. Hello! I'm so glad to see you devote a whole post on oregano. I live in New Jersey and last year I purchased a plant that I planted in my romantic herb garden next to the kitchen. I potted and winterized it indoors on my porch and gave it very (if ever) water. I was ready to compost it thinking I killed it, but in early spring I saw signs of life! I have been keeping it in a big pot on my deck along with some violas and I just love it. It's worked out so well because instead of finicky pansies and such I have the oregano which will come back again and again. It's so forgiving and drought tolerant. My favorite use for it is my special seafood sauce. This is my first time posting - I found your blog through Skippy's Garden. I'm a newlywed with my first home and garden (4 years old). It's really nice to meet another kitchen gardner.